All tracks composed by Koji Kondo, except 1.36, 1.52, and 2.7 composed by Toru Minegishi. 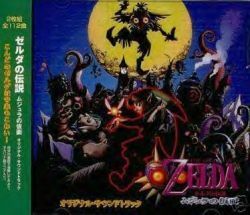 Music Composed by Koji Kondo, Toru Minegishi / Nintendo C., Ltd.
Sound Effects Programmed by Yoji Inagaki, Mitsuhiro Hikino, Takuya Maekawa / Nintendo Co., Ltd.
Administrated by Takanao Kondo / Nintendo Co., Ltd. Product Management by Tomomi Takemura / OHTAKE LTD.
Design coordinated by Etsuko Ueda / Pioneer LDC, INC. Promoted by Takashi Iida / Pioneer LDC, INC. Supervised by Kenji Inaba / Nintendo Co., Ltd. Produced by Yuichi Sekido / Pioneer LDC, INC.
Executive Produced by Akihiro Kawamura / Pioneer LDC, INC.